Shanghai’s world-famous skyline is even more dazzling at night and this evening tour takes in the views from both land and water. 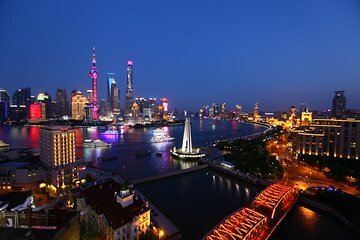 Explore the Bund waterfront, see the soaring skyscrapers of Pudong and Lujiazui, and stroll along the atmospheric Nanjing Road, then set sail along a Huangpu River and admire the illuminated city on a scenic night cruise. This was FANTASTIC experience. Our tour guide was so kind to work the schedule around us coming late from the other tour. He was informative and his English was great - very, very nice man. River tour was PHENOMENAL as Shanghai is a BEAUTIFUL CITY, I travelled around six continents and Shanghai is now my favorite sharing the fist spot with a Hong-Kong :- This tour should NOT BE MISSED!!! !